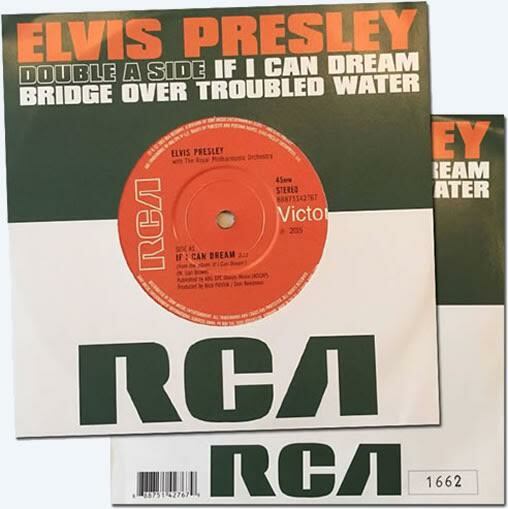 The numbered, limited edition 'If I Can Dream'/'Bridge Over Troubled Water' 45RPM Vinyl Single' has debuted at No. 1 on the UK's Vinyl Single Chart. Probably it does not take huge numbers to make this chart, but it is a number 1 just the same as we start to watch the global impact of the new 'If I Can Dream: Elvis Presley With The Royal Philharmonic Orchestra' CD. The new charts positions are about to emerge. The current positions are: Number 1 England, Australia,Scotland. Number 2: Ireland & Austria. Number 3: New Zealand. (Billboard no.21 : That is an impressive listing in a chart where rap, hip-hop and country music dominates). In other european countries progress can be made for instance in Belgium (no.10) and Holland (no.17). I have no idea how the album is being received in for instance South America or Asia. If anyone has more information: please make posting. Thank you Gorse, but I have enough coasters. funny that they spliced An American Trilogy from the 1972 Las Vegas and from the 1973 Aloha version. I wonder why? Yes, me again !! I reckon it got there by 'Cilla's promotion rather than merit. Pesonally, I think it's #1 achievement is a very shallow one. It tells me that Elvis' music has to be so dramatically dressed up to convince the average man on the street. 30 No.1's is proof that his music doesn't need it. Just heard the shorts on iTunes. By no means a fan of this concept. It's for aesthetic enjoyment only if your not an Elvis purist. It works on some tracks like Love Me Tender, It's Now or Never, Can't Help... and "Bridge". They should leave well enough alone on In The Ghetto because its a message song that only requires minimal backing. The strings make it sound like just another pretty ballad. The strings really sound like they're trying to outdo the original drama from the title track, Lovin' Feeling and Trilogy though Duane Eddy's twangs gives the latter a nice touch but otherwise it sounds like a constant climax throughout the song. The efforts on Burning Love and "Steamroller" really trash their brand. I would much rather an album of remixes like they did with "Conversation", Rubberneckin' and I Got a Feelin' in my Body because (a) it suits the music and (b) the songs aren't well known EP songs. After listening to the cd a couple of more times, I've reconsidered my thinking on "It's Now Or Never". I do like the new European flavor that it now has and the voices of Il Volo can be given credit for that in a positive way. However, my main issue with "In The Ghetto" still remains. The song ends with the female voices loudly repeating the words... In The Ghetto! ... about 5 times without a fade out. It seems to be a case of overkill with the use of the back-up singers. listened to the cd now 2 times. Also here mixed feelings. For me Love me tender is a bit outplaced, you hear a very young elvisvoice, compared to the others songs. And the song is simple. For me it works better to keep it simple. Not so keen on this In the ghetto also. I like You've lost that loving feeling, Bridge and An American Trilogy the most. They are also the songs that can have a big orchestra sound. Burning love is very cool too and Fever also. Nice duet. Nicely done. the intro of Fever is a bit strange though. I thought our man was going to burst out in Summertime from Porgy and Bess but it was Fever. Old MacDonald, Yoga Is As Yoga Does... you can't ruin anything there. Perhaps it is too early at this stage - while the album is at the number one spot at this moment - but will there be a follow up? (Like Elv1s was followed by Second to None). This will be a hard one to top. Reason for this is that the most appropriate songs are already been used. Will the public also willing to buy an album with lesser known songs? But let us just fantasize for a while. I really think the Don Robertson songs are very suitable. Some songs to think about? 1. The impossible dream, 2. They remind me to much of you. 3. It's only love. 4. We can make the morning. 5. My boy. 6. Always on my mind. 7. Suppose. 8. It hurts me. 9. Something. 10. The sound of your cry. 11.Unchainded melody. 12. I really don't want to know. Any other options? When Todd Slaughter suggested this album about 12 years ago I was very much against it. However it has been done well and it showcases the voice very well. I am amazed at how successful it has been. It has brought Elvis back front and center again. This will be a big seller from now to January. I expect there will be a volume 2. This will help sales of other Elvis albums. I see Elvis #1s is back in at 75 in the UK. I hope Brian Quinn gives us regular updates on sales etc. As long as Elvis is successful there will be a continuous supply of Elvis product. That is what we all want. Yes a rather special and wonderful time for us committed fans who never leave the Elvis ship during stormy weather. I will make the most of this occasion as it might never happen again. I also feel, and I choose my words carefully, that this release though not better or necessarily more exciting than previous favourite albums, has that extra bit of class. ....and Number One in Scotland! The album has also entered the Australia’s album charts at number one. I just finished listening (with headphones) to the entire If I Can Dream cd. Here's my unbiased, 41-years-an-Elvis-fan opinion -- There are six excellent (5-star) tracks! - "Bridge Over Troubled Water", "You've Lost That Lovin' Feelin", "Love Me Tender", "How Great Thou Art", "And The Grass Won't Pay No Mind", and yes... "Burning Love". There are four tracks that I feel are very good that I give a 4-star rating - "There's Always Me", "An American Trilogy", "If I Can Dream", and "Steamroller Blues" which finishes with a subtle sound of steam in the left channel... nice touch. "It's Now Or Never" has a more European sound now (if that makes any sense) but the vocals of Il Volo fail to add anything special to the song. "Fever" starts out reminding me of Elvis' 1966 recording of "City By Night"... it's a fun listen with Michael Bublé but not one of the best tracks. "Can't Help Falling In Love" is okay, but it doesn't even come close to the quality of the original. The weakest track (by far... in my opinion) is "In The Ghetto". The album would've been better if "In The Ghetto" had been left off and replaced with the superior (5-star) "What Now My Love". Conclusion -- This cd isn't everyone's cup of tea, but it certainly isn't anything to be embarrassed about. I personally would recommend it to anyone. I'm glad it's a #1 hit in the U.K. and I hope it at least cracks the Top-10 on the Billboard 200 chart here in the U.S. I'm looking forward to the final sales total for the first week. No 1 again!!!!! I'm so proud! It really deserves it. Re-issues will never be capable of doing this again... this is honestly a whole new sound and Elvis has never sounded better, clearer or had arrangements and accompaniment so worthy of his talent. The album is also now, of today with the new chart, No1 in the UK! According to the BBC "Elvis claims the Number 1 spot with 79,000 chart sales, giving him the second-fastest selling album of the year behind Noel Gallagher’s High Flying Birds’ Chasing Yesterday"
I bought the album and have listened through it a couple of times. I have mixed feelings about it. In some spots, it sounds absolutely beautiful, in other spots, it sounds contrived. A few things really stand out, or at least leave me thinking. Why did they choose Burning Love and Steamroller? Those songs do not work in this context. What is going on with Duane Eddy's guitar? Was he trying to play out of tune? I never appreciated Elvis' back up singers until I heard this crop of studio musicians who had never sang with Elvis. They sound okay, but man, they are not the group we all know and love. Overall, I give the album a 5 out of 10 score. JerryNodak wrote -- "How many units does a single cd release have to sell these days to top the UK charts?" Jerry, hopefully Mr. Brian Quinn will be able to obtain that information for us all, and I'll also be interested in how many units it sells for the first week in the U.S. Thank you, Gorse. Ditto from my end. I fully agree that people put al lot of energy into this project. And as I gather most people appreciate it. So for clarity sake I am very very happy with that. I guess (again) it is just not my taste. As Moseleyman asked me I gave it some thought of how it would be if less well known (movie?) tracks were given another treatment like this. And I must concur that seems quite an interesting idea as I am sure certain songs will be so much better than those mostly poorly produced songs (though it might not sell that well). This selection is mostly perfect in its original form(at), hence my reservation. I am not saying that it is ruined, far from that. I have a lot of time for your opinions through the years Natha but on this one I am at the other end of the spectrum..
To my ears the CD release is mind blowing and I have not experienced the atmosphere and emotion created in a collection except perhaps in the 'How Great Thou Art' album. A lot of thought and time has gone into this release, and coupled with the most enjoyable, interesting and well researched Joanna Lumley programme on him last night will only enhance his reputation with the uncommitted. Just curious: How many units does a single cd release have to sell these days to top the UK charts? Great Single...Great CD....I'm just proud of our MAN and the fact that he still gets the respect and attention that he deserves!! I listened to the cd as some think one may judge too soon. Just a few quick notes from my end. Burning Love starts of with an intro that does not make any sense – and so does the end. Fever – I feel that the orchestra does not match with the young voice of Elvis. I don’t like the duet type while it is obvious that the the other voice is responding to the orchestra, while (as in all remakes) Elvis is not responding to the orchestra but is in harmony with the original. In the ghetto has a draggingggg end without the King himself. So it ends boring. There is more to say, but let’s keep it to this. Basically I have a feeling that the orchestra is doing one thing and Elvis is doing something else. The only enormous thing that helped me going through this and enjoy was that Elvis the King is so much upfront that it lifted my heart over all the (expected) disappointments. A once in a life time listen. I am happy to leave the copies for sale to those who enjoy it. Am I getting older? Maybe. Or possibly I am just another type of Elvis fan. For me the originals have that extra; maybe it is because Elvis WAS involved and this is fabricated. Did they really find 1662 idiots? These singles are Limited Editions and numbered. As can be seen on the cover shown they have printed at least 1662 copies. 100 or 200 copies sold?